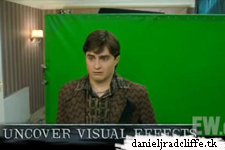 Via EW.com, there's a video from Daniel in some deleted scenes and extra footage from Harry Potter and the Deathly Hallows part 1, the video can be viewed here. • “On the Green with Rupert, Tom, Oliver and James”: Cameras follow Rupert Grint, Tom Felton, Oliver Phelps (George Weasley) and James Phelps (Fred Weasley) for a round of golf to profile the friendship they developed over a decade of filming Harry Potter movies. Fun.